It's "I Could Not Care less", Not "I Could Care Less"
It’s “I could not care less”, not “I could care less”. 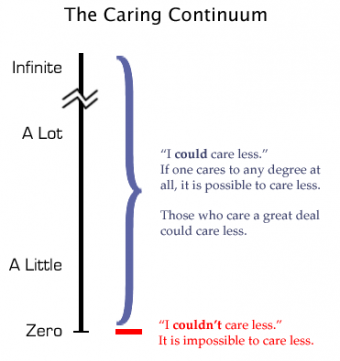 These two phrases are often used interchangeably when someone is referring to something that they don’t care about at all, even though the latter implies that you do care somewhat, possibly a lot or just a little; it’s unclear from the statement itself. The former leaves nothing in doubt. 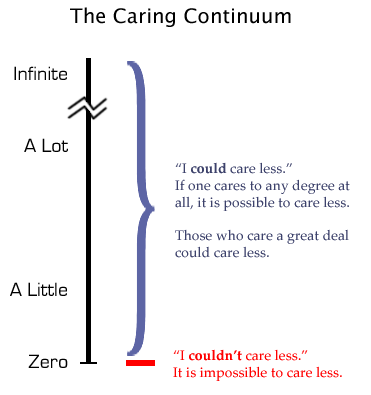 You absolutely don’t care at all, implying even a modicum of caring would be more than what you feel. The correct expression, “I could not care less” or, alternatively, “I couldn’t care less”, originally came to the United States in the 1950s from Britain. The use of the expression in Britain is documented as far back as the 1940s and is thought to have been somewhat common for at least a decade before that. The first documented case of the incorrect form “I could care less” was in 1966, in the United States. It’s not clear why the drop of the “not” in that phrase became common in the United States. It’s possible it is due to a misunderstanding of the original intent of the phrase or, more likely, simple laziness in speech. Isn’t this said in the form of sarcasm? I heard this said correctly all my life until I was in my 20’s, I think (in the 80’s), so I’m saddened to learn the mistake began so early. I have surmised that people say it wrong in a misguided attempt to avoid a double negative. But in this case, the double negative is essential to the message! It’s possible that I could care less. But because my care is so low to being with, I am at the proper level of care, which is little.